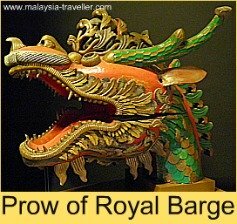 As you would expect, the National Museum is one of the top museums in Malaysia. 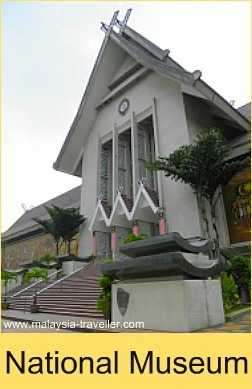 Opened in 1963, the museum is housed in a striking building incorporating traditional Malay and Minangkabau architectural features. Two giant murals of Italian glass mosaic line the front facade of the museum and portray highlights from Malay history and culture. 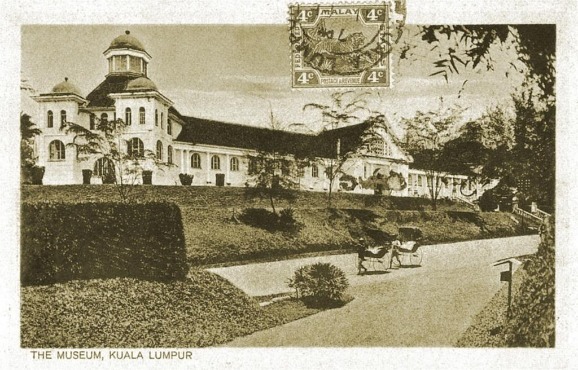 The museum is located close to the KL Lake Gardens and KL Sentral and was built on the site of the old Selangor Museum which was partially destroyed (by mistake) in an allied bombing raid during WWII. 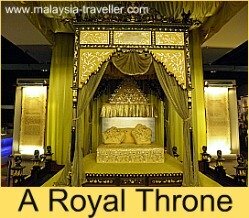 The museum had a major upgrade in 2008 and today it tells the story of Malaysia's rich historical and cultural heritage. The exhibits are arranged in 4 galleries covering 2 floors. This gallery displays the results of historical research and archaeological excavations. Exhibits include Palaeolithic-era stone tools from 200,000 years ago, Neolithic pottery, a replica of Perak Man skeleton (reckoned to be 10-11,000 years old), a bronze Son Dong bell found near Muar, Johor which originated from Vietnam in 150AD, and a seated Bodhisattva statue thought to be around a thousand years old. 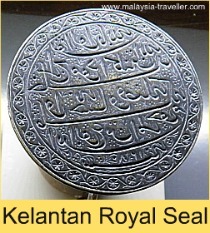 This gallery traces the development of early settlements, the emergence of Malay kingdoms and sultanates, the coming of Islam and importance of Malacca as a trading centre. This gallery covers the colonial era starting in 1511 with the Portuguese, followed by the Dutch and then the British and their exploitation of raw materials with the spice trade, tin mining, rubber and so on. The gallery also records the Japanese occupation during World War Two. Being a bit of an old colonial myself, I found this gallery to be the most interesting. The large scale model of a tin dredge is one of the highlights. Bringing us right up to date, the exhibits in this gallery include items from the Malayan Emergency, the struggle for independence, the formation of Malaysia, the political system and the economic development of Malaysia. In the grounds of the museum there are a number of exhibits worth inspecting. 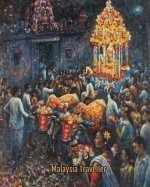 There are examples of transportation over the decades - a bullock cart, a gharry from Melaka, a trishaw, an Austin Seven, an old Dennis fire engine, the first Proton Saga (the first made-in-Malaysia car), and an early carriage from the Penang Hill cable car which was used from 1923-1977. - a steam tank engine (like Thomas!) made in England by W.G. Bagnall Ltd in 1927 which was used for dock shunting in Singapore and Port Swettenham (Klang) until 1964. 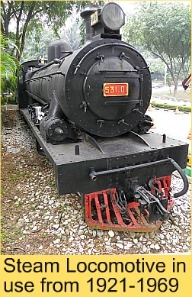 - a Class 22 Diesel locomotive made by English Electric Co. and introduced to Malaysia in 1971 and used until 2002. Also in the grounds of the museum is a traditional Malay building made of cengal wood which dates from 1884 and used to stand in the compound of the then Sultan of Terengganu until it was relocated to the museum in 1974. Worth visiting. International standard in terms of presentation but it will not take you long to see everything, say 1 to 2 hours. Click here to see the National Museum's Official Website. You can find a map on my Kuala Lumpur Lake Gardens page. Parking is available - RM2 per car and RM1 for motorbikes. RapidKL bus No.115 (KL City Shuttle RM2 per day). For KL Hop-on Hop-off bus, Muzium Negara is located at bus stop no 12. Get off at KL Sentral station. The museum is 500 meters away. Follow the pedestrian signboards. The Carcosa Seri Negara is a luxurious all-suite heritage hotel housed in the former residence of Britain's senior representative during colonial times. It is located within distance of the National Museum. 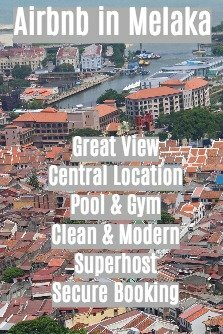 Other hotels in the vicinity include the Hilton Kuala Lumpur and Le Meridien Kuala Lumpur which are located next to KL Sentral, a short walk from the museum.